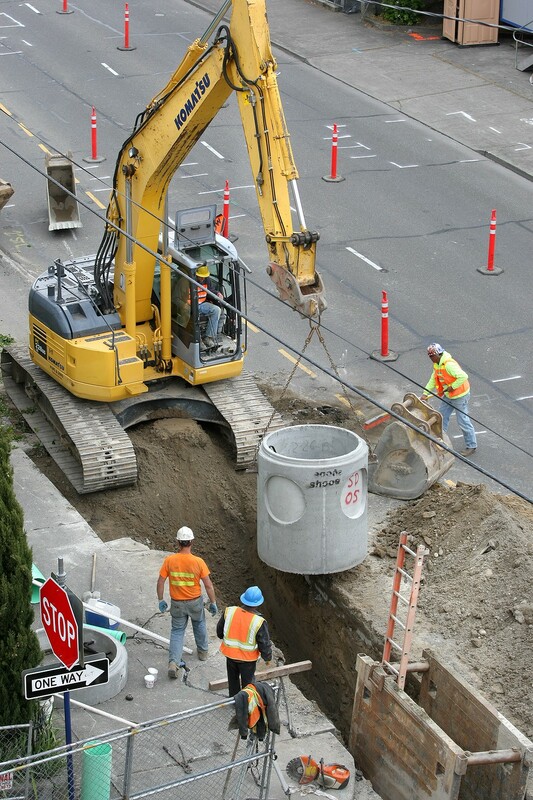 As you may have noticed, work on Washington Avenue has started to ramp up. Crews from RV Associates have closed down Fifth Street at Washington Avenue, mostly to install new stormwater drains as well as some water and sewer pipes. Next week, it’s going to get crazier, with the closure of Sixth Street at Washington Avenue to do much of the same work they’ve been doing on Fifth. The closure starts Tuesday. Mayor Patty Lent assured me that the city will keep open one of the two roads — Fifth or Sixth — at any given time, so Fifth should be reopened before Sixth closes. The closure will remain until about May 19, though there will be “intermittent” openings, including for the Armed Forces Day parade on May 16. This, as frequent readers of this blog know, is only the beginning. 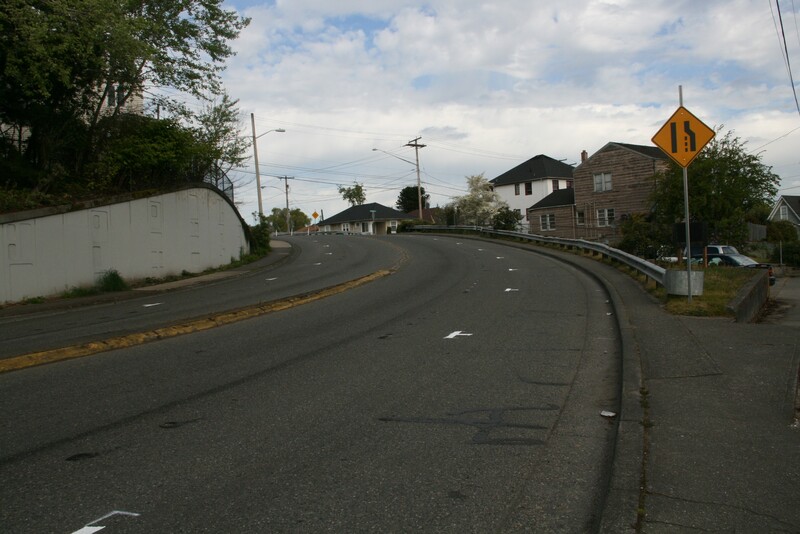 A few weeks from now, northbound Washington roadway, between Sixth and the Manette Bridge, will close. Traffic will be diverted into the southbound lanes while crews put in utilities and install wider sidewalks and bike lanes on the northbound side. There’s certainly no shortage of roadwork going on right now. A section of Marine Drive was paved with some fanfare recently, a chunk of Trenton Avenue in Manette was, albeit without fanfare. 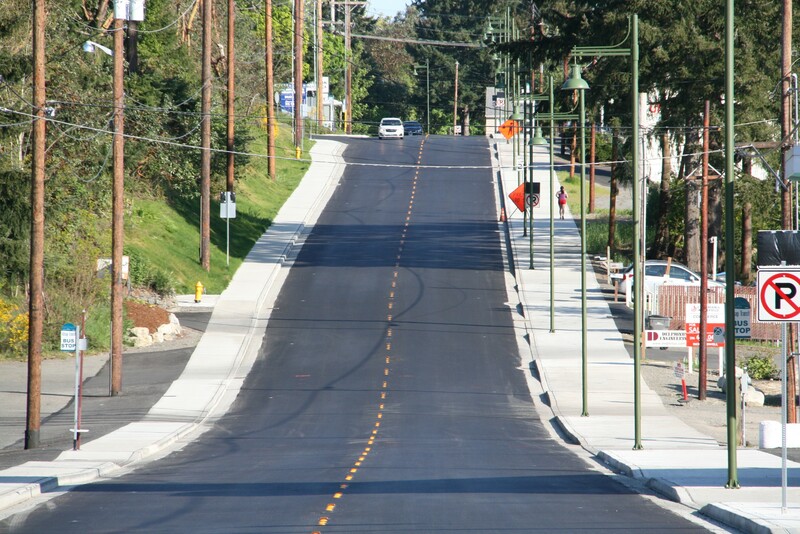 Along with Washington Avenue, Austin Drive near NAD Park will also be repaved this summer. I’ll keep you posted on these city projects. Please don’t hesitate to ask questions along the way. 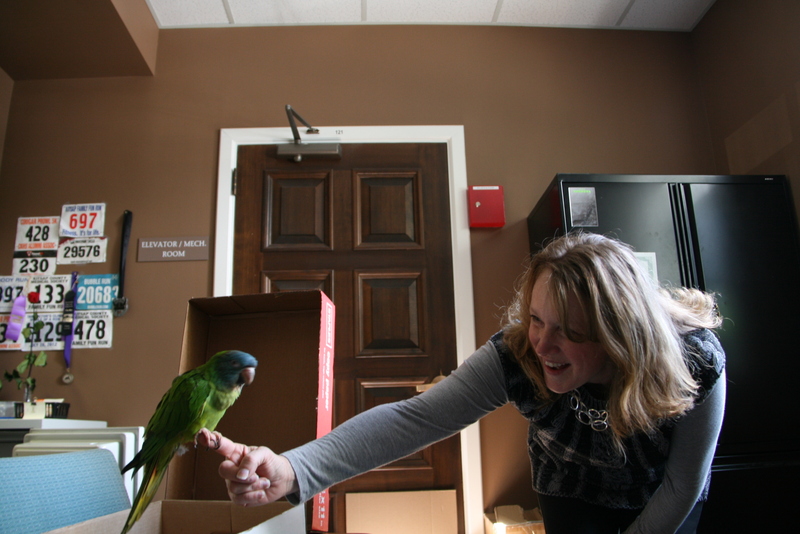 Jennifer Smith visits with the parrot, found outside the courthouse Wednesday morning. 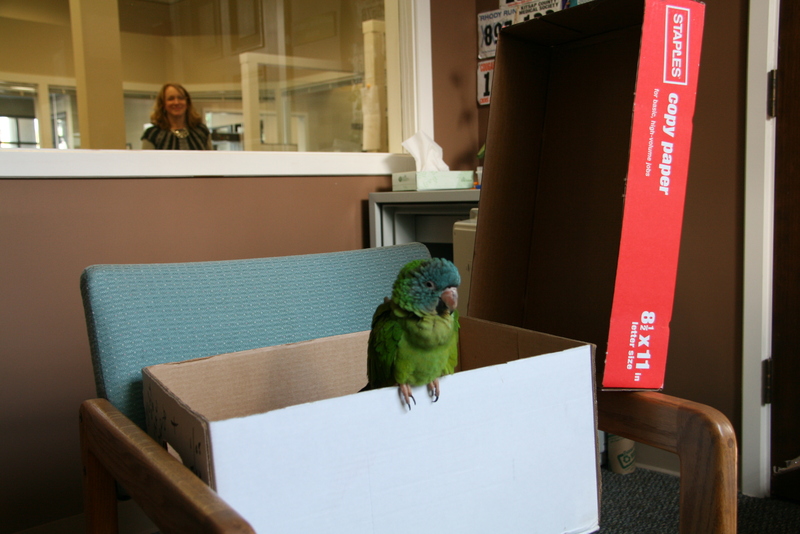 A green parrot showed up at Bremerton Municipal Court Wednesday morning, to the surprise of courthouse staff. “I thought it was an obnoxious crow,” said Becky Hoffman, senior legal technician at the Park Avenue facility. Hoffman, along with Security guard Mel Devin, spotted the bird, with a teal head, perched on a window near the entrance, right underneath a light. Dave Boynton, the city’s home detention specialist, put on gloves and brought the bird inside. It appears domesticated. The staff put it in a box with some water, a saltine cracker, blueberry and strawberry. “They gave it a nice comfy home,” Devin said. UPDATE, 12:30 p.m. April 29: The bird’s owners have been found. 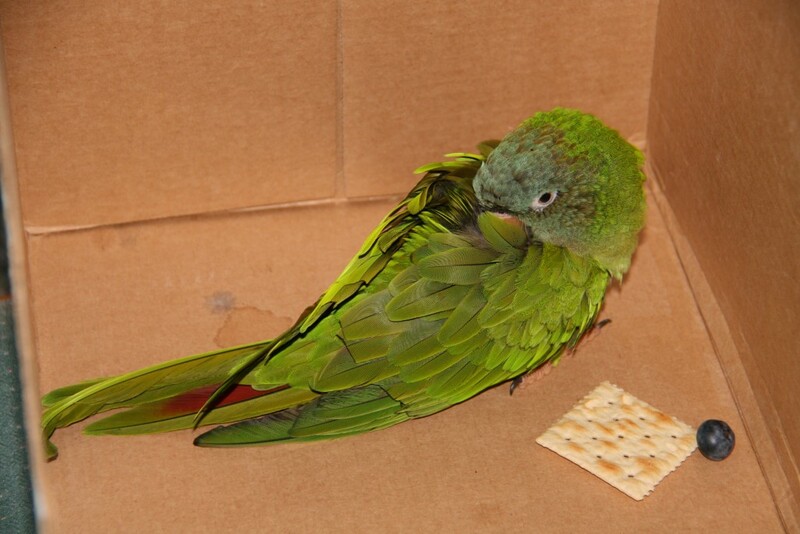 A Kitsap Humane Society Animal Control officer was able to find a craigslist ad where the owners were asking if anyone had found a parrot. The bird, named Drax, is home, safe and sound. 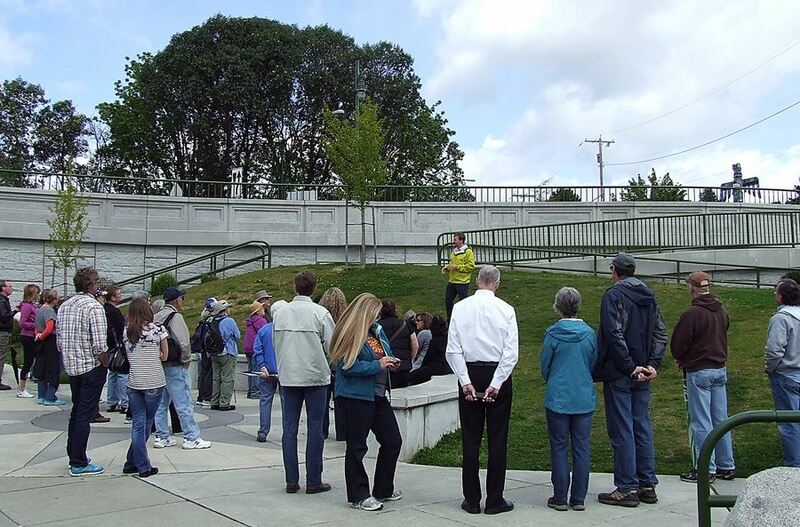 If you’re looking for a secret green space to find solitude in Bremerton, look no further than just northwest of the Warren Avenue Bridge. Amid our urban jungle is a grove of mostly pine trees along with around 2.5 acres of fairway-like grassland. Funny thing: it’s not even a park. But in the end, I wondered: What was the name of this little area? My question to the city leaders in attendance was met with shrugs. “It’s a right-of-way,” said Jim Orton, operations manager for the city’s public works department. 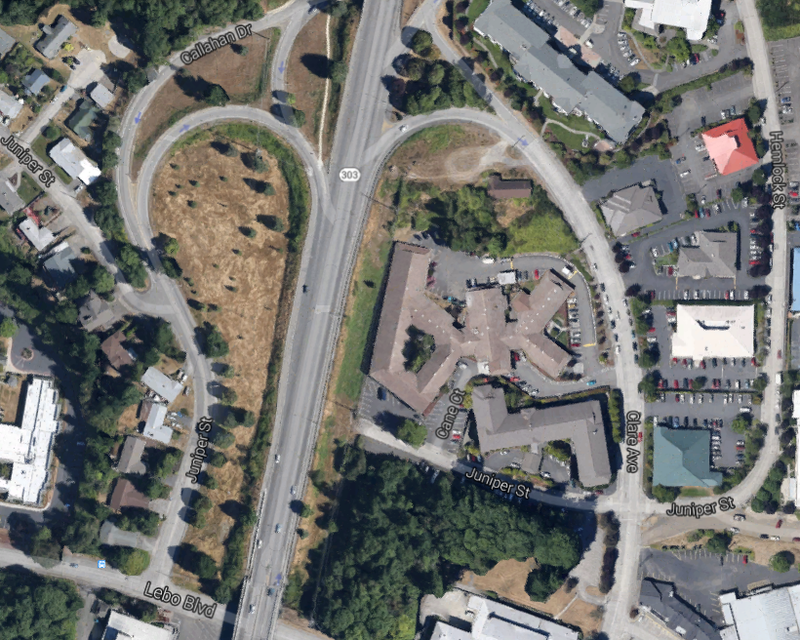 The nameless, teardrop-shaped land is indeed a right-of-way for Highway 303, which runs adjacent to it, along with Callahan Drive and Juniper Street, which connect to the highway (see picture). Orton told me that up until a decade ago when an Eagle Scout project cleared the land and planted some trees, it was basically a big patch of scotch broom. In the time since, it had become overgrown. But city crews recently cleared it again, revealing a nice meadow that just begs for a frisbee to be thrown on its grass, or perhaps a picnic blanket. The only interruption you’ll likely have relaxing in this little green space is the humming of cars passing by on Highway 303. If you do head out there, take some pictures and send them my way for a followup post. Oh, and don’t forget to check out nearby Stephenson Canyon, a gorgeous fern-lined trail just to the west. And while we’re at it, anyone have a name for this little space? 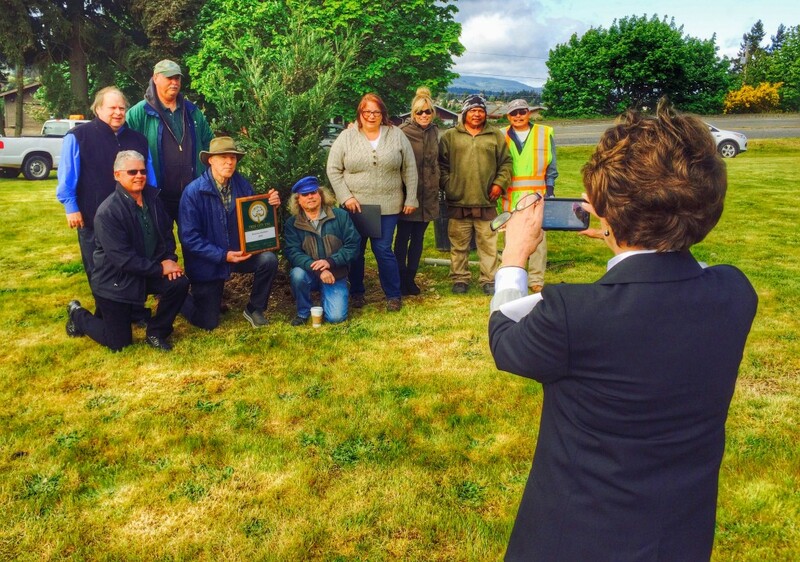 Mayor Patty Lent takes a picture of many of the city’s tree committee members Friday at the annual Arbor Day ceremony. Photo by Laura Henderson of the beginning of our walk. To me, history is most importantly about people and the amazing things they do, so I chose to begin our latest monthly Story Walk with a few words about him. 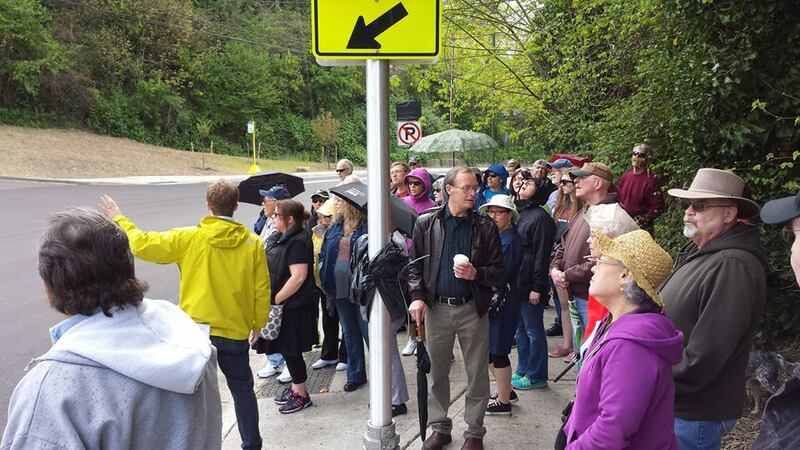 At least 35 of you came to walk Saturday the road named for him, Wheaton Way, along the newly remade stretch. We traversed the new, almost mile-long 10-foot sidewalk and had some good discussions about the road’s past, present and future. Photo by Mark Alan Moshay at the midpoint. We only got rained on one time, while we visited the site of the now deceased Maple Leaf Tavern — proof positive that there’s really no way to stay dry anywhere near that property, even when the bar is long gone. I hope the experience was fruitful for everyone. I’m still working out the kinks for next month, but I hope you will join us in May for the next one. Watch this blog for details as I know them. Photo by Jim Schmidt at the end. Little known fact: there’s actually no such thing as “Lower,” or even “Old” Wheaton Way. 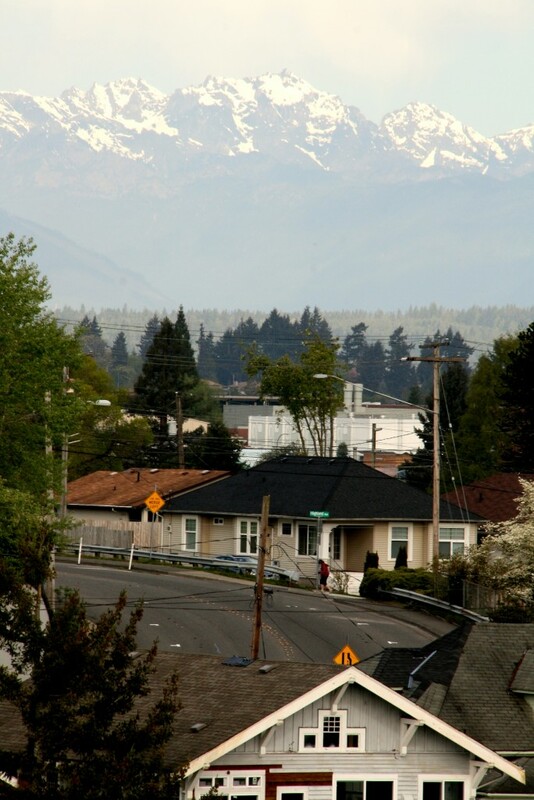 It’s just a title we Bremerton residents use to distinguish a meandering little thoroughfare from the much larger commercial corridor nearby. Roots of the road date back to the 1920s. Once lined with popular spots like the Maple Leaf Tavern and the hopping Bay Bowl, it became an oddly wide street with only a few businesses left (the Bay Bowl, I should add, is now home to a Thai restaurant). But “Lower” Wheaton Way, as it became when the Warren Avenue Bridge was built, was just reconstructed, adding wide sidewalks, bike lanes, street lamps and a new surface. 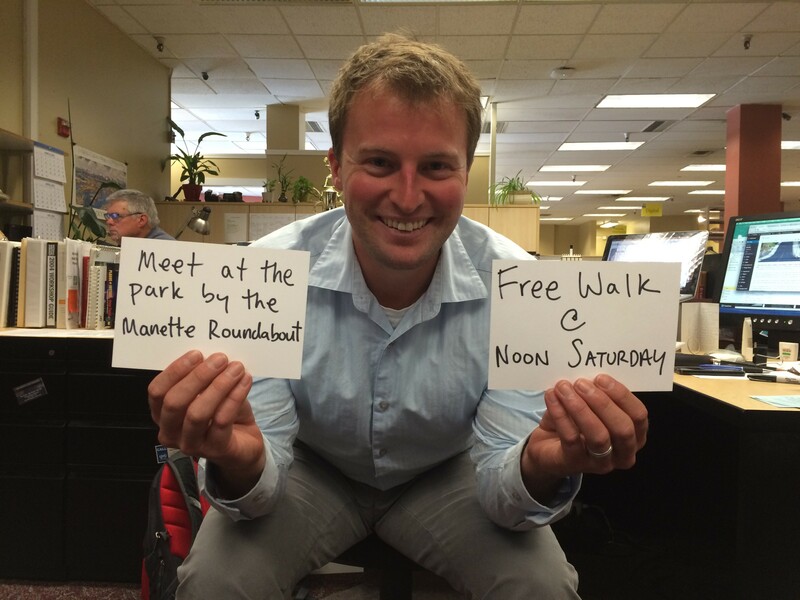 At noon on Saturday, I invite you to come out and walk this nearly mile-long stretch of revamped roadway. We’ll tell tales of its history, discuss its transformation and contemplate its future. We’ll meet at Whitey Domstad Park, the little green space next to the Manette Bridge roundabout and just above the Boat Shed restaurant. And speaking of local merchants, the Boat Shed and FOUND in Manette have agreed to offer 10 percent off to those who go on the Story Walk, and The Weekender on East 11th will take 15 percent off an item that day following the walk. The City Council conducted fairly brisk business at its meeting Wednesday. The seven members approved a proposal to allow beer and wine tasting at the farmers market; they created a new parallel parking zone on Washington Avenue and 11th Street; they even took time to congratulate student science fair winners. You might say the printer discussion, however, got jammed. The decision to lease a new printer for the city’s parks department, at a cost of $9,200 a year for half a decade, wasn’t actually due for much talk. The Council discussed it the week prior at its study session and had determined it to be appropriate to go in the consent agenda, a bundle of items it votes on all at once. But during public comment, Robert Parker, a civic activist who lives in Port Orchard, took issue with the printer, saying the parks department would need nowhere near its 150,000-page printing capacity. Parker, who has spearheaded efforts in the city to include the battle against discarded needles and graffiti, knows a little something about printing: he’s run a print shop since 1997. “This is way more machine than we need,” Runyon said. His comments were too longwinded for Councilman Eric Younger, whose “point of order” brought about an up or down vote on whether to kill the discussion since it was a consent agenda item. He was joined by Council members Dino Davis, Leslie Daugs and Mike Sullivan in providing the four votes that would move the Council past the issue. Jeff Elevado, recreation manager for the park’s department, defended the leasing of the Ricoh MPC 6502 model copier and printer, saying it was necessary for the volume of brochures and program guides the department puts out each year. “All our research is telling us that this is the right printer,” he said. Just about everyone weighed in and ultimately, the Council voted 5-2 to pass the consent agenda, which included leasing the printer (Runyon and McDonald dissented). “It was thoroughly vetted,” Davis said of the issue. Quite an argument for one printer, albeit a pricey one. But the discussion did make me wonder about how city government — or really, any organization — approaches such purchases. Elevado told me later that there’s a pool of government entities that bid together on these pieces of technology, helping to bring their costs down. The city doesn’t just require a copy machine in the parks department — there’s at least one in every department. I wonder if there’d be a financial advantage if they were all leased together through one contract. And for that matter, what other pieces of equipment and technology could be bundled up and purchased or leased together, attaining the benefits of economies of scale? Perhaps that’s the debate to come. Soup’s on! 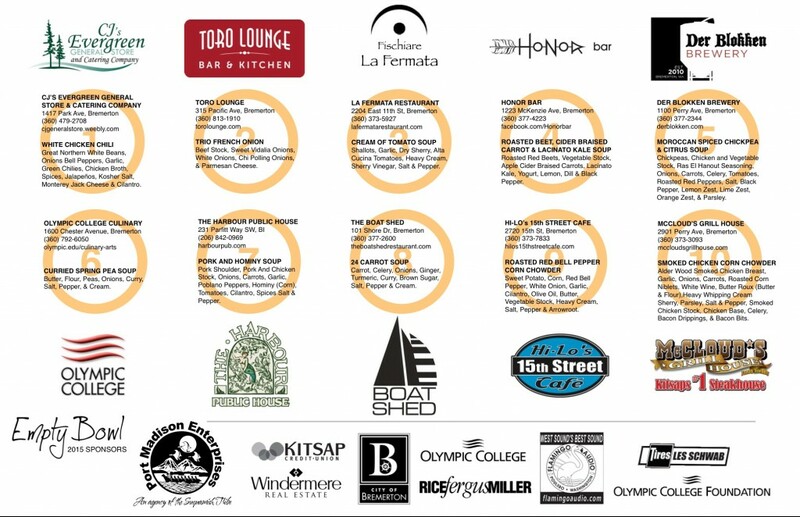 One of the biggest fundraisers of the year in Bremerton comes to Olympic College Saturday. The Empty Bowl, which started in a church in 2009, has grown to the confines of the Bremer Student Center. All proceeds benefit the Bremerton Foodline. The concept is simple and has really taken off here. Using the symbol of an empty bowl, two main groups of artists — those skilled in pottery and those of the culinary variety — come together to battle community hunger. The result: more than 50 gallons of soup are served up starting at 2 p.m. Saturday, made by some of the most talented chefs in Kitsap County, and somewhere in the neighborhood of 470 clay bowls are crafted beforehand, for donors to take home. 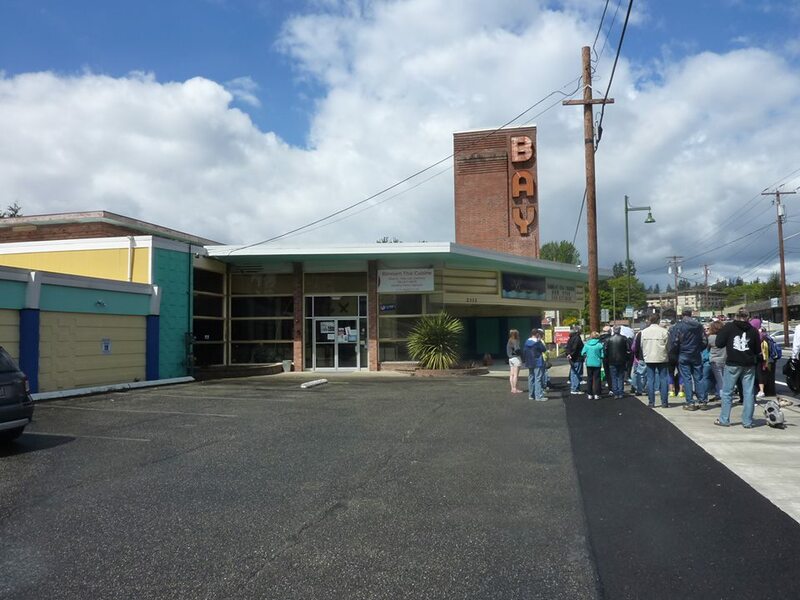 Christine Davis, who has chaired the event for five years now, has watched it grow from raising $2,300 her first year to more than $17,000 at a packed Bremerton Eagles hall last year. Dr. David Mitchell, Olympic College’s president, said the college is “thrilled” to have the growing event on campus for the first time. 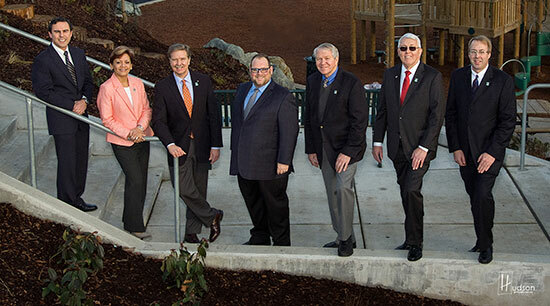 “Olympic College is about community and it is rewarding to see local organizations working together to assist fellow Kitsap residents who are in need,” he said. The Olympic College Clay Club has been involved before. 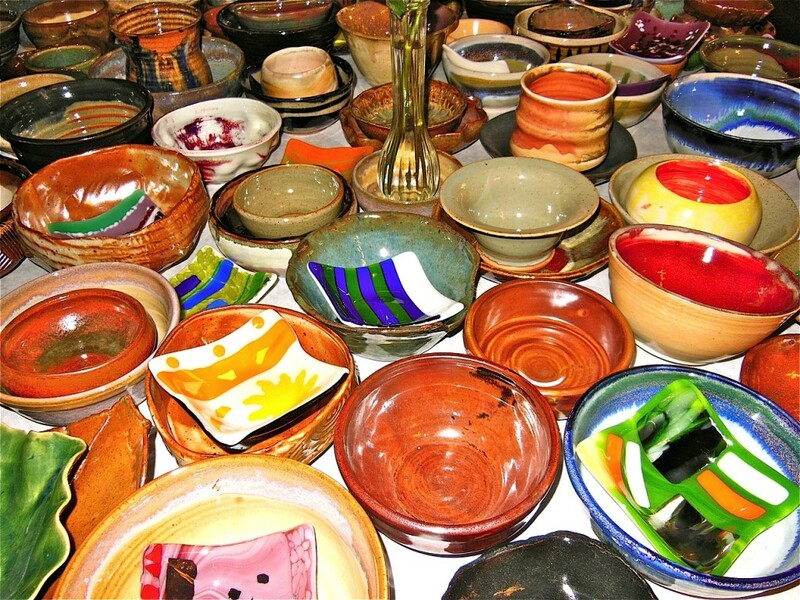 In fact, two artists — Darroll Clark and Charles Martin — have been competing to see who can make the most bowls. I am told they’re nearing 100 each. Tickets are $30 and available at the door Saturday or by contacting emptybowlbremerton@gmail.com or 360-286-4754. Alternatively you may contact 360-479-6188 for more information or go to Bremertonfoodline.org. Oh! And lest I forget, here’s the menu for Saturday. Craig Salt can tell some great stories about working the Bremerton ferry run. For 35 years, Salt (above, middle) worked for Washington State Ferries, taking passengers and cars back and forth across Puget Sound. 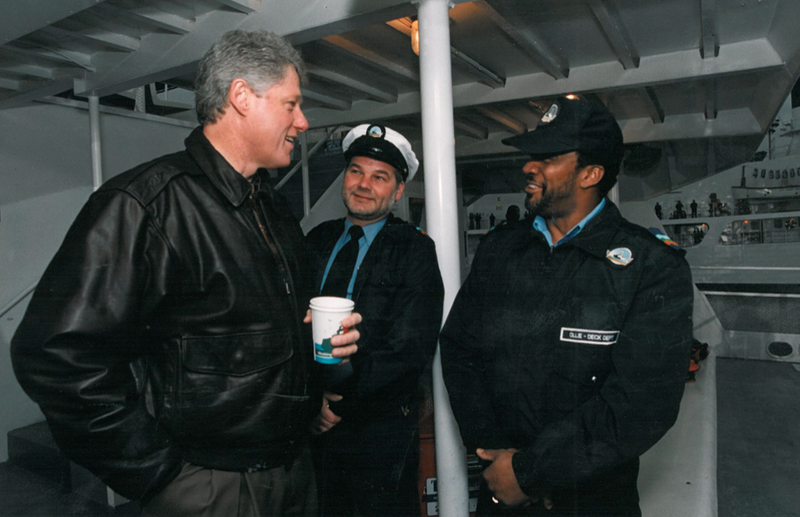 For me, one story stands out: Salt’s encounter with none other than our 42nd president, Bill Clinton. Salt most frequently worked the Bremerton run and particularly enjoyed the passenger-only ferry the Tyee. He has found memories of all his time in the system, which he retired from a few years ago. Clinton came to Blake Island in November 1993, a fact you should know because it was featured on my President’s Day video. Salt was selected as one of the seamen who would accompany the president, along with other country leaders that make up the Asia-Pacific Economic Cooperation (APEC) group. Salt was surprised to find Clinton ventured out to the rear of the boat, taking in the Seattle skyline with great interest. He started asking questions. Salt is quite the conversationalist and local historian himself, so filling Clinton in about the Yeslers and the Mercers of Seattle’s past was not only an honor, but something easy to do. But when Salt realized he was going on a bit long and felt he was keeping the leader of the free world from his counterparts, Clinton put him at ease. He still has the White House photo (above), though not much else from the visit. What’s left is mostly in his memory. But it’s a visit he says he’ll never forget. “He was a nice man,” Salt said. One note of caution: please don’t determine this post to be political. It’s not. I just wanted to recognize a nice memory from a man who helped drive a ferry back and forth for more than three decades. 1. A new convenience store has opened downtown. 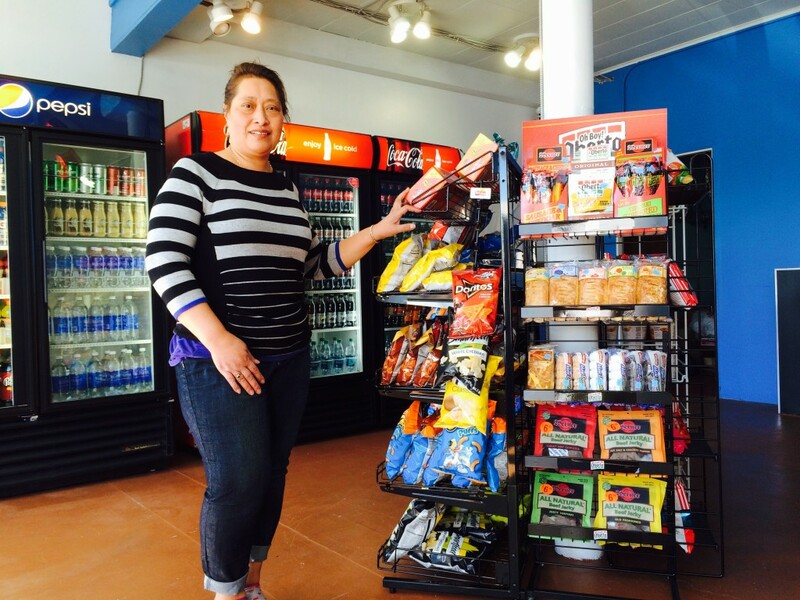 On Friday, A&L Pacific Island Minimart opened next to Boston’s Pizza & Deli. Owner Lola Maae (pictured) is still getting settled in, and plans on selling cigarettes and beer once the licenses come in. But the main goal of Maae, who’s from American Samoa, is to have specialty Pacific Islander products she says you can’t find anywhere outside Seattle right now. Maae’s lived in Bremerton for 12 years and still works for Yak’s Deli on Kitsap Way. She hopes her new 1,100 square-foot store becomes a tradition. “It’s a little family business,” she said. 2. The garage door is hip downtown. Garage doors appear to be all the rage these days. Der Blokken and the Manette Saloon already have them (and there are probably more that are escaping me right now). Seems a good idea as an effort to expand the ambiance past the front door. South Pacific near the ferry terminal just installed one (above). And Carlos Jara at Toro Lounge says one’s coming there too. 3. An Irish restaurant may just open on 15th Street. 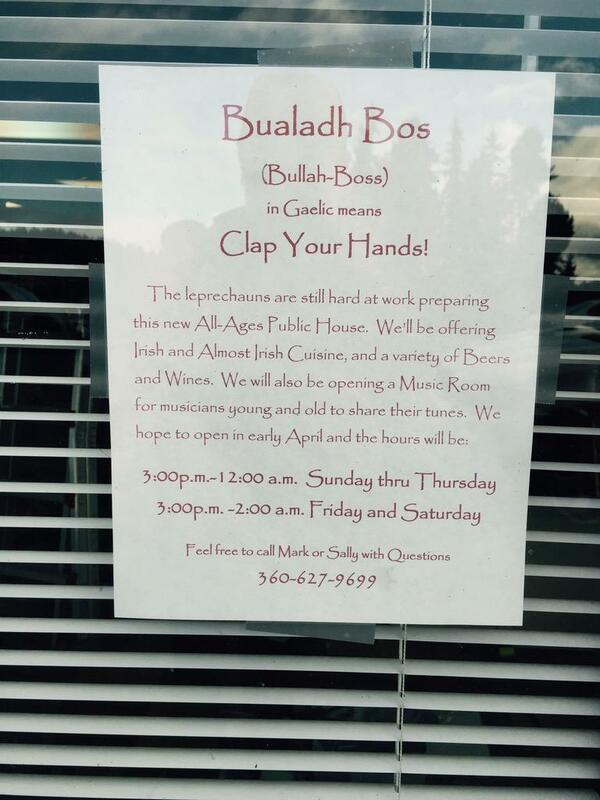 An Irish restaurant called “Bualadh Bos” (means clap your hands in Gaelic) may open soon on 15th Street. 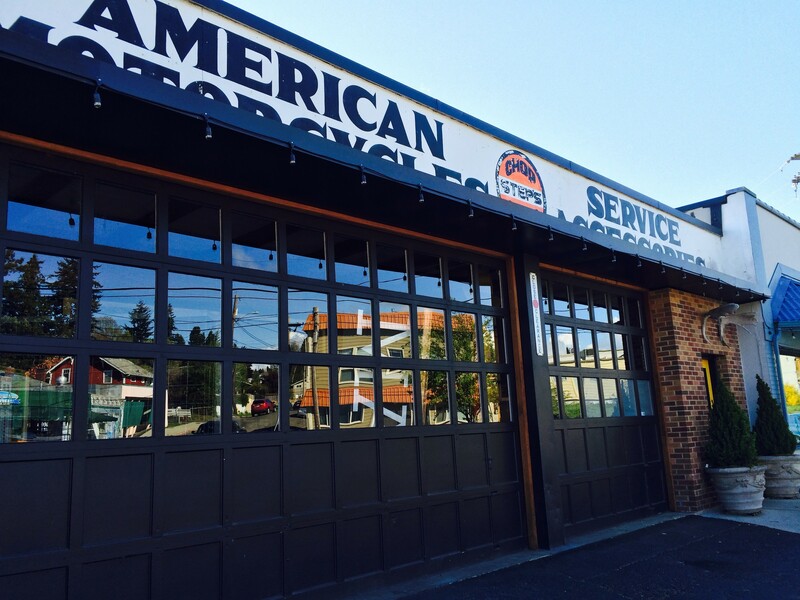 The owners are working their way through the permitting process and developing the place at the same time. It’s hard to say as yet when they’ll open, though the sign indicates early April. I say we give it some time given all the requirements businesses must meet with permitting and regulations. 4. Starbucks by the ferry is getting a remodel. 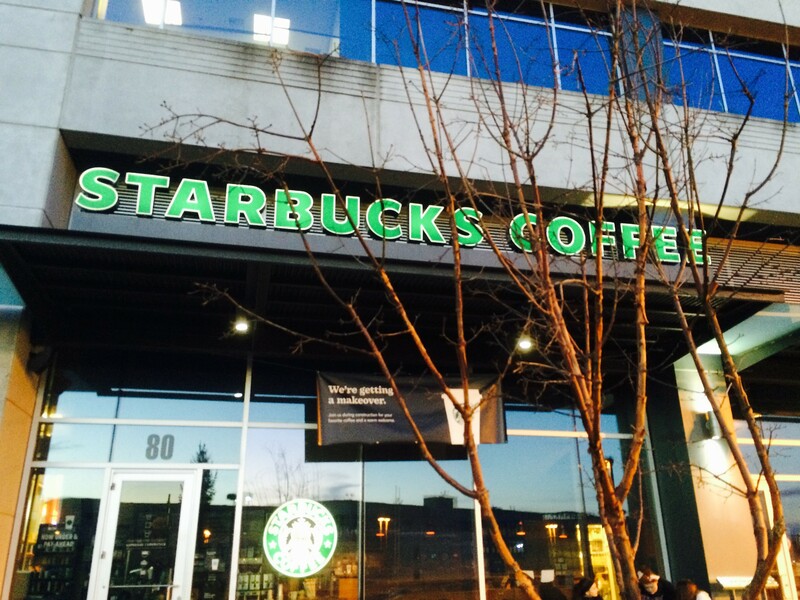 Not to be outdone by the announcement of new Starbucks’ stores in Silverdale and in Kingston, the Starbucks by the Bremerton ferry terminal will soon get a makeover. I don’t have many details yet but I will keep you posted. 5. 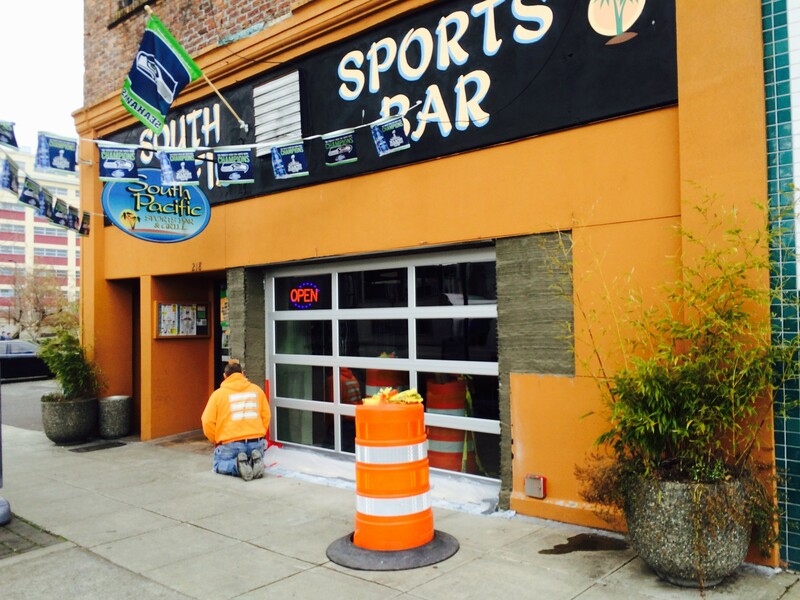 The Manette Trading Company bows out. Sad to see Stewart Wilson has closed the Manette Trading Company. Wilson had told me a few months ago business in the vintage and antique world was a struggle. The location displays prominently on East 11th, so we’ll see if a new tenant lands there soon. 6. 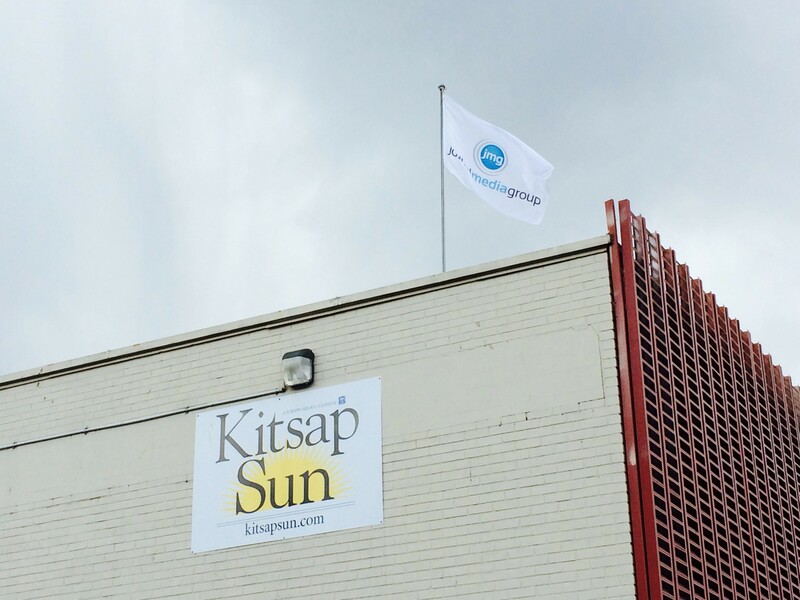 Bremerton’s Kitsap Sun headquarters is officially a part of Journal Media Group. And finally, on the personal side, the Kitsap Sun formally changed hands as of April 1. We’re no longer owned by E.W. Scripps in Cincinnati and are now a part of a newspaper chain based in Milwaukee. The good news is we’ll still do what we do best — keep you up to speed on what’s going on in this town, and this region.